Are you still trying to figure out how you can make this whole ecommerce thing work for you? Wouldn’t it be great to get some tips and insights from someone who was in your shoes just a few short years ago and has experienced impressive results since? You are in luck! On this episode of The Amazing Seller, you’ll hear from guest Kevin Sanderson as he shares his story and what he’s learned from his ecommerce journey. Don’t leave it all up to guesswork! Learn from Kevin’s unique perspective and take in his sincere advice on this informative episode! Taking full advantage of the international marketplace. Can you imagine achieving the level of success it’d require to bring your ecommerce brand to the international marketplace? Does it feel like an unreachable dream? Ask yourself why it seems so impossible because it’s not! On this episode of The Amazing Seller, join Scott as he sits down with someone who has made it happen with their ecommerce brand. While it wasn’t easy, Kevin Sanderson says that sellers like you should not be so afraid of taking your brand international. Sure, it has its ups and downs but it has been a profitable and educational experience for Kevin and his business so far. Learn more about Kevin’s story on this exciting episode! Don’t get too far ahead of yourself! One of the worst things you can do when you start a long distance race is to start off sprinting. When it comes to long-distance running, the key to success is to pace yourself. The same principle is true when it comes to getting a successful ecommerce business off of the ground. Kevin Sanderson says that too often he’s seen ecommerce business owners get way too far out ahead of themselves before they needed too. He encourages business leaders to take their time and go step by step through the process of building and then expanding their ecommerce business. Get more helpful tips from Kevin on this episode of The Amazing Seller, you don’t want to miss it! Whatever gets measured, gets managed. How do you make the right steps and get your ecommerce business off of the ground? How do you get started when you have a family and you are trying to holding down a full-time job, is it even possible? On this episode of The Amazing Seller, you’ll hear from Scott and his guest, Kevin Sanderson. Kevin explains that the road to getting your business off of the ground can be challenging but anything worth doing will provide its own set of challenges. His advice is to start by taking a look at how you spend your time on a daily and weekly basis and then evaluate where you can start shifting things around to make time for your budding business. Listen to this episode to get additional insights from Kevin! Is it too late to ride the ecommerce wave? One of the common questions that Scott gets from TAS followers is, “Is it too late to catch the wave of building an ecommerce business?” The answer that Scott provides time and time again is a resounding, “NO!” The truth is, it’s not too late to get started and even if it is too late, so what? Be that person who breaks barriers and challenges the status quo. If you feel compelled to reach for something beyond what you currently have, you are going to have to take risks! Get Scott and Kevin’s full take on the state of the ecommerce industry by listening to this informative episode, you don’t want to miss it! [2:15] How did Kevin get started with ecommerce? [5:30] Kevin gives an update on his business success and why he went international. [10:00] Succeeding in life and business. [12:00] Go one step at a time, don’t get ahead of yourself! [16:30] Learning along the way. [21:00] Whatever gets measured, gets managed. [27:00] Kevin talks about mindset and how he responded to losing his job. [34:00] Tips for budding leaders and ecommerce entrepreneurs. [36:00] Delegating and connecting with virtual assistants. [38:00] There are always opportunities out there! [41:00] How to connect with Kevin. …guest back on the show who’s actually going to talk about how to grow an ecommerce business, Amazon business to a $250,000 while still working a full time job. His name is Kevin Sanderson, good friend of mine, also a referee. So be careful, he might call a foul on you. Kevin, welcome back to the show man. [00:00:32] Kevin: Hey Scott, thank you so much for having me back. [00:00:36] Scott: We just hang out a couple of weeks ago. We were in Orlando together at the Click Funnels event and we were talking and I was a little disappointed you didn’t have your whistle with you. I had to call a time out a few times and you weren’t there. [00:00:52] Scott: It would have been amazing. We got to get you a referee shirt with TAS on the back and then with some flags and we can throw a flag at the meet ups and stuff. [00:01:02] Kevin: That’d be awesome. I’ll keep it all under control. [00:01:06] Scott: All right man. Let’s kind of get caught up here on the air. That’s really what I wanted to do here. I know a lot of people getting started talk about time. You’ve got a family, I’ve got a family, when I was building my business whether it’s this business or any other business that I’ve done it’s always been about you have to sacrifice time somewhere. And where does it come from? Because whether you’re working a full time job or you’re running one business but yet you want to start something else, there’s always time. We all have 24 hours in a day. Let’s first off get people caught up to where you are at and what’s been happening and then I do want to drill into how do you do it when you have a full time job? How do you balance everything? So let’s dig in. Okay, so how have things been since we’ve last chatted? I’ll link up in the show notes to anyone else that wants to hear the past episode. If you just go to theamazingseller.com/503, I’ll drop Kevin’s last episode there. You can get caught up there but maybe just give us a little recap and then get us caught up. [00:02:11] Kevin: Sure, so the short of it is I basically got into ecommerce doing private label about two and a half years ago taking the money I had earned as a ref for one season and investing that into my first product. And the short of it is I’ve been reinvesting that in, putting a little bit more money where I can to grow the business to be more. And when we last spoke I had about eight SKUs and I’ve been expanding that close to 40 SKUs now and we can talk more about what I’ve done to expand that. Then I’ve also expanded from the US, Canada to the UK and then used the UK as a launching platform to go into the other European market places which would be Germany, France, Spain and Italy. And Amazon actually recently contacted me about going into Japan which I thought was kind of cool there calling me as opposed to me trying to figure my way out there. So last year, 2017 was my first full year doing it. Started private label in February 2016 and year over year growth from 16 to 17, it’s not exactly apples to apples because it wasn’t a full year in 16 but it was up about 150% and for the last 12 months I’m been looking at about $250,000 in sales. [00:03:47] Scott: That’s awesome. And again you’re still working a full time job. S just so people know, and you’re reffing too. Are you still reffing? [00:03:54] Kevin: Yes. Still planning on reffing this fall. In fact before we hit record we were just talking about probably going to have some spring games coming up here for at least in my area, they sometimes use spring training. [00:04:09] Scott: You’re a busy guy, you got a family too. Right? [00:04:13] Kevin: Yeah, wife and two kids. [00:04:15] Scott: Wife and two kids. How old are the kids? [00:04:18] Kevin: Actually my youngest just turned three and I’ve got a seven, almost eight year old. [00:04:23] Scott: So you’re busy. [00:04:24] Kevin: Oh yeah, there’s no doubt about it. [00:04:27] Scott: You’re a busy, busy guy. I know that. Myself just personally from having… Well now my youngest is 10 and then my middle is going to be 20 in this month and then my oldest is 22. She’ll be 23 in July which is just crazy. We’re all busy and like everyone talks about time, how do you do it. That’s really what I do want to talk about because you’re reffing and you’re doing that. How do you still stay a dad and have your wife still not be mad at you? There’s all those things because we balance that stuff. I know I do. I’m like I don’t want to seem like I’m working all the time but I’m trying to do this damn thing so I can have free time but where’s the free time and it’s kind all of that stuff. Sometimes you’re sacrificing time in the beginning so you can possibly be rewarded later with that lifestyle. So there’s a lot of stuff we can dig into here. First off like when you first launched and now you say you have like 40 SKUs, I’m assuming there’s variations included there. [00:05:32] Kevin: Yes. And I would say a lot of it is variations. I know you use garlic press and fishing tackle a lot as examples. So if it was fishing lures we can talk more about it, but it would be like having different types of fishing lures for different fish and things like that so kind of within the same niche but then niching within the niche and sometimes niching more. [00:05:55] Scott: Yeah, I love that. Are you pretty much in the same market with your products? [00:06:01] Kevin: Yes. I would say my products they might serve different audiences but the general concept, they are all the same niche. I would say. [00:06:12] Scott: Okay, and again I’m just, I’m trying to see too like even for you moving forward so you’re building out something that if someone comes to you they could… One customer could buy multiple products not just one. [00:06:22] Kevin: Yes and that thankfully happens. I love it when it does. [00:06:26] Scott: Yeah, that’s big. Okay, so now you mentioned that you went international. Now, what was the thought behind going international so soon I guess for me? Like personally I’m thinking to myself, because we haven’t, I told you in the new brand we haven’t gone international yet and my whole thing was like well, I want to get everything running and growing on the US side and then I can take and bring the stuff over to other market places. Why so soon for you especially being a busy guy and that’s a whole other thing you got to figure out stuff. What brought you to do that? [00:07:05] Kevin: Well I guess I have a philosophy of I only have so much time so I want to maximize the sales I can get in that time period. So the way I look at it is if Amazon.com is a cake Amazon.ca which is Canada would be the icing on that cake so to speak. And I am generally getting about 10% to 15% of my sales in the US I’m seeing in Canada. So that’s without having to add additional minimum order quantities. So I’m selling through that same inventory faster so more turns as time goes on and I don’t have to find new products to go there just basically taking the same copy, the same photographs, the same keywords that work here work there. And I’ve pretty much found it’s almost take the same thing. It’s copy and paste. It’s oversimplifying it but I found it’s helped me. It’s just that compound effect of little things start adding up over time and lots of drops in that bucket will help fill the bucket up faster. [00:08:14] Scott: Absolutely. And as far as going into like the UK for example, like so now are you shipping in two different sets of inventory? One for US, one for the UK and then also additional markets? [00:08:30] Kevin: Yes. So the way I structure it and in Europe there’s different ways of handling it but I for that purposes because I’m registered in the UK not in the other market places, because I import into the UK and I house my inventory into the UK and then anyone that buys let’s say in Spain their purchase is shipped from the UK. So for that reason though that’s a whole other complicated mess sometimes but if anyone is thinking about that they should probably talk to an account but what I found for my situation that’s what the simplest is to just go to one country and ship to there and store there. [00:09:11] Scott: That’s what I’ve heard others doing and honestly that’s what we’ll be doing as well. I just think like you said it’s going to simplify the process as much as possible obviously accounting wise that can get a little goofy. Again we’ll probably have to talk about that at a later date. But so my thought again going into this interview with you was to really focus on how do you do it and being full time still working? How do you figure out what you want to work on and what I’m already gathering right now is you’re trying to take what you already have and trying to leverage other platforms. So you really don’t have to do anymore work as far as finding suppliers, doing sample runs, all that stuff, creating the listings, pictures, all that stuff. You’re basically just trying to figure out how you can push that to another marketplace. [00:10:04] Kevin: Exactly just trying to be as focused, in on the timeline I do have because I’ll be married another ten years and some. I want to be there for my kids especially the important moments. I like my job, I like the people I work with, I want to continue working there. So I look at it as it can be ‘both and’ as opposed to ‘either or’, me being in ecommerce business meaning that you can do all these other things you want to do in your life and still have an ecommerce business by being crystal clear about what it is and I’m trying to do so I try as much as possible and I get it wrong quite a bit. But I try to be very clear on, okay, these are the things that I need to get done this month, this week, today that will move the ball forward that if I don’t get the other things on my task list on, then I just push off for another week, another month, it’s not going to be the end of the world. One of those things that are going to keep pushing that ball forward. [00:11:10] Scott: That’s smart and that’s hard to do sometimes. But once you get a clear vision. Now, you’re past the beginning stages that some people are facing as far as like what market do I go into, is it too competitive, our products, like all of that stuff. If you were to start over today again from scratch, would you go in the same direction that you’re in right now or is there something that you would change? [00:11:38] Kevin: I would say I would probably go in the same general direction. Now the key of it is to look at it as if you’re walking up the stairs in your house you’re going from one step to the next, to the next, to the next, not worrying about okay, well I haven’t gotten to the landing yet so I’m going to worry about the very top step but I haven’t even started up the stairs. I am just trying to be very focused on what is that next step and just keep focusing on that next step because where I see a lot of people getting tripped up is they worry way too much about advanced strategies too early on. Like okay, you just launched your first product. Great. Well, now start focusing on PPC and maximizing keywords. Don’t start worrying about products five and six and going into Europe. Just get launched, get some momentum and then you can use that momentum to then spin off to other places. [00:12:41] Scott: Now, do you find now that you are kind of like focused on one market in a sense, I know you said you’ve got different audiences that could still probably purchase those products but for the most part, you’re kind of direction is in that niche or in that market, do you find it easier to think about what products to launch next because now you are focused on that market? [00:13:06] Kevin: Yes, and what I would say I do, so using fishing lures and I’m not selling fishing stuff but if let’s say I was selling bass lures and there were certain lures that might work well for trout and let’s say they are similar. And I don’t know bass and trout. But let’s just say for pretend purposes we can make slight alterations to the lure for bass, maybe have a smaller, minimum order quantity or be part of the same minimum order quantity for the bass lures to try out trout lures and maybe we have a couple different colors because we’re not sure which one the market’s going to like better. But by making a small investment kind of in a, I’m holding my hands together in circles like overlapping circles, so markets that would have an overlap but might still serve a different audience, what can I do to start serving a complimentary audience who might like both of my products or they might be, that product might open up to something else. So sometimes just putting up a little bit of investment behind okay, people are buying trout lures so how do I do trout lures and then just keep going down that trail to maybe from freshwater to salt water or something like that. Just finding other ways to serve the market even if it’s not the exact same people but people that would overlap. [00:14:41] Scott: Yeah, that makes a lot of sense because again you already done most of the work at that point and now it’s like, I’ve always said the people too if your easiest way to launch additional SKUs is to just run variations but the second way is to really figure out a way to adapt that product to another part of the market and make it call out as well. Another example we could use is like if you went into the accessory business for like car parts of some kind, like you were going to fit it for a certain car but yet you could also probably add something to it that could be universally fit to another car and now you’re going to be able to then reach that part of the market. Like I said, you just… When you’re doing this you’re going to find the work to find the manufacturer, find your supplier, your agents, like all that stuff. When you do that, you want to try to leverage that as much as possible. And staying in within that main market I think is key because then you can, I like to sub, sub, sub down and then start to work down yourself back out of it if you can because now you’ve got more, you got more of a brand or you got more of a product suite that could lend itself to each other and makes it easier for you to then sell and cross sell and all that stuff. So I love it. I love what you’re doing and it sounds like you have focus and I think that’s a lot of times what’s hard for people especially when they are lacking time. They want to just get started and they want to climb all the steps. They want to jump right to the top of the step and they don’t want to climb those steps but you’ve kind of broken it down. Has it always been like that for you though Kevin? I mean it sounds like it’s easy. [00:16:21] Kevin: Oh yeah, it’s simple. I never get it wrong. No, actually, I will say I probably have learnt to be very laser focused through trial and error. A lot of times thinking this is that next step, whatever that is and realizing wow, I just wasted time. Because taking a step back I’ve just come to learn that time is going to pass no matter what. We have to realize that is that I have this reminder of how time passes in my garage. I have these two Nike forewoods which anyone who plays golf might wonder why would anyone own Forwards, let alone two of them. So I bought them back in 2004 on eBay thinking, I’m going to sell these. And the product “research” that I did back then was to go on Nike.com and I saw that they were selling for say $399, or something like that. Like 400 bucks. And they were selling on eBay for $40. So I was like oh wow, I didn’t even know arbitrage was the word to do that sort of eBay to eBay arbitrage for this and resell it but then after I hit submit and bought them and I bought two of them, I came to realize that oh my gosh, no one is actually buying these $400. Maybe I should have looked to what people are actually buying on eBay not what Nike is suggested price was. And then what I ended up doing was nothing. If I had at least just sold them for what I bought them for then at least I would have said, “Okay wait I just made a sale here.” Then I could have started getting a little momentum a little bit going but basically I didn’t get back into ecommerce like actually selling anything till my first sale was made in 2015 which was just a little bit of retail arbitrage I did just to get my feet wet. [00:18:25] Kevin: So I lost 10/11 years that I can never get back. So that’s probably one reminder for me that drives me and keeps me going of no matter what, time is going to keep going. It’s not going to slow down because I wanted to, it’s going to be, I’m going to look back and say oh wow, I was able to do these things in the last ten years or I missed the boat and didn’t’ do anything and that I think the hard regret to swallow. .
[00:18:57] Scott: Yeah. Totally is. Again, people get stuck in that well that didn’t work or I’m just going to pause that whole thing and then they get back and they go oh man, I wish I would have just kept going with it, look how much further I would have been. It goes just like working out. You’re like, I thought about working about six months ago. Imagine if did that like six months from now I’d be pretty ripped but I’m not because I didn’t do anything. I thought of it. What’s the Chinese proverb? I should have planted a tree 20 years ago but the next best time is now. It will grow if you plant it and then you can look back 20 years from now and go, “Damn, I’m glad I planted that tree.” But it’s true. We always can look back and we get caught up in our day today and all that stuff. But again that’s it we come down to figuring out why you’re doing it in the first place. What you’re doing, the way I’m seeing what you’re doing is you’re building an ecommerce business on the side. You’re doing it because number one you want to build another asset, another revenue stream for your life but also it’s something that you can cash out eventually if you want to. And cashing your chips and say, “I want to sell this business,” and then go on your so called retirement or whatever. You’re building something that you can technically sell them in future if you wanted to. And it sounds like you’re doing it right. So I commend you on that. Let me ask you this, for anyone that’s listening right now that says, “It’s great and all but I just don’t have time. You don’t know me. I don’t have time to do this thing. I want to, I want to have the freedom to be able to go to this event or I want to be able to be at my kids’ events or I just want to be able to travel more. I don’t have the time right now.” What would you say to that…? Like if you had a buddy that said, I just don’t’ have time but you know that they probably do have time. What kind of advice? [00:20:53] Kevin: Well, here’s the thing I would say to start with. As the management theorist strategist, Peter Drucker once said, “Whatever gets measured gets managed.” So if someone actually took the time into write out everything they did in the day, now granted it will be hard to actually write everything you do in a day but if you just at least made an attempt to be more intentional about figuring out where you spend your time, I’d bet someone’s going to find more margin that they realized. Because what ends up happening is, someone will realize like okay I just spend half my day caulking my shower. Well, is that something you could have paid someone $40 to do. That’s a mistake I’ve made multiple times. Doing these kind of DIY projects that maybe didn’t necessarily need to be done or I could have paid someone if I thought about the value of my time. Now, granted maybe that’s something to do when maybe at step three or four but not step one but also look at what are you really knowledgeable about? This is something I challenged some of my friends with. I’ve had friends tell me they wanted to get into ecommerce and things like that but they know everything day in and day out of the 24 hour news cycle. Well, how do you know that stuff? Because you’re watching the news. Not to say we shouldn’t be knowledgeable of what’s going on in the world but do you need to know everything day in day out? Because it can become soap opera. Or if you know everything in sports. Like I’ll be honest. Although I know the rules of high school football, I understand a lot of how the game is played from like who’s the best team in the NFL, I generally have a good idea but I don’t necessarily know everyone’s win, loss records week to week. I don’t know the ratings of all the different quarterbacks. I have a decent idea but I don’t know it all that intimately. [00:23:00] Kevin: So if you have intimate knowledge of something that’s not necessarily serving you I would say challenge yourself as to do I really need to know this much stuff and then look at your inventory of the time you’re spending and say, “Oh wow. I’m spending a lot fo time watching sports center or watching fox news or CNN or Amazon NBC or whatever the case is.” Or if you have someone says I don’t have time but they’ve got four favorite shows on Netflix well, is it worth it? It maybe not completely cutting it out but saying only this show is important to me but the others I’m just going to doing just to fill time. [00:23:51] Scott: Rabbit holes to go down. Or we’re like a squirrel chasing a nut. [00:23:58] Kevin: Exactly. All these little shiny objects. Now, we talk about shiny objects syndrome in entrepreneurial space but just in the general consumer day to day space, there’s so many little things that are trying to vie for our attention. It’s so easy to go down like these rabbit holes like you’re saying. [00:24:16] Scott: It’s a distraction, it’s basically what it is. I actually pulled this up because I had this installed on my computer for a while. It’s called Rescue Time. And it’s basically a piece of software that goes on your browser and it will basically track, not even your browser it’s your computer. It will track all of your computer on your computer. So basically if you have Photoshop it will tell you how long you’ve been at Photoshop. If you’re into an editing app it will tell you that. But also if you’re on Google it will tell you that. If you’re on Facebook it will tell you that. If you’re on YouTube it will tell you that. So at the end of the week, it will give you this itemized list of all of your time and where it was spent. And now if you’re on Photoshop and that’s your job then that’s where most of your time is going to be but it should be on Facebook for three and a half hours. It shouldn’t be on YouTube for ten hours. You don’t realize like you said until you measure it. You don’t really know. You’re just like ‘I don’t spend that much time on YouTube’ until you look at it you go ‘holy crap. I guess I do.’ Maybe I need to give myself some boundaries. Maybe I need to tell myself I get an hour a day or I get a half hour a day. I think you have to set boundaries with these social platforms and these things that we can be… It’s like you’re bored in a sense which years we used to just sit there and like just take it in. We used to maybe sit at the mall and you just people watch a little bit. Like you ever sit there and you watching people but nowadays it’s like everybody’s head on the phone and you’re on Facebook, you’re on this one, you’re on that one. Well, if you sitting here waiting for your wife in the supermarket why don’t you do some product research. Why don’t you contact supplier. There’s time, it’s just a matter of how you manage it. I think a lot of times though Kevin, I found, I talk to a lot of people that come up to me and they’ll ask like what I do and don’t really know what I do online and I usually just say ecommerce. They’re like, “That’s new. So you sell…” Yeah, generally on Amazon and other platforms, our platform.” I don’t say sales funnel or anything like that. I really get confused. Basically I’ll just say that and they’ll be like, “Oh that sounds good. I’d love to be able to do that.” I’ll tell them about it. [00:26:20] Scott: But I know they are just… They think it’s cool, it’s a cool idea but they don’t realize the amount of work that it’s going to take and they are not willing because they are comfortable. I think if you’re comfortable you might not think you are but until you actually start down that road, you’re going to know within the first week if you’re built for this or not. I think it all comes down to the reason why you’re doing it. If you know the reason why you’re doing it you’ll push through and you’ll do it. And it sounds like you’ve kind of figured that out. I just like to try to reverse engineer like why you’re different than some other people that might say that they want to do it and they have probably less than you’re doing but they say they have more. Trying to get in the mindset I guess. [00:26:59] Kevin: Sure. So one thing I would say on that is maybe at the time this didn’t feel like a blessing but I look back and say this absolutely was. This was as Tony Robbins would say life happening for me, not to me is almost five years ago I lost my job. I was working for a large company and I was in the middle management role and we got bought up by another large company. My level didn’t exist in the new structure and so I got to feel firsthand what it’s like going from thinking oh things are going pretty well because I lasted through the great recession so to speak than now than economy is on an uptake, all of a sudden someone has pulled out from underneath me and now all of a sudden I don’t have that job. So for me it gives me a little bit more like okay, push ahead, push ahead because you never know like as much as I think my job’s secure now and I like the people I work with and I enjoy working there, who knows? I’m in the insurance business but people seen there’s all kinds of changes in the insurance business the last few years and so you never really know. And I think one thing that trips people up is getting into the mindset of someone who works for a big company having worked for some fortune 500 companies in my career that everything is kind of guaranteed for you so to speak. You show up, there’s a script of you do this, even if you’re the high level management, there’s still somewhat of a script of this is what’s expected of you. These are the results that you can expect to see and when you get into the more entrepreneurial space you don’t know what’s going to happen. I think people get this, and I don’t know that they know the word is fear but it really is. [00:29:11] Kevin: This fear of like what if I try and it doesn’t work out? I hear these stories on The Amazing Seller podcast and other podcasts and I watch YouTube and what if that doesn’t happen for me? I think that’s a fear of a lot of people have. It’s just of being disappointed but it’s like anything. If you don’t put yourself out there and have the potential of being of disappointed then it’s definitely not going to work out for you. But if you at least try then you give yourself at least the opportunity to say you know what this might actually work because then what ends up happening is if things don’t work out exactly the way you want it to. Chances are it’s not going to be a complete failure. There’s going to be some sort of learning and then you can start making course corrections and potentially things will start working out pretty well then you start getting some momentum. Then things all of a sudden start building up and you start picking up steam but you don’t give yourself that opportunity unless you at least start getting in the game but too many people they are concerned about getting in the game for whether it’s fear or disappointment or we’ve been basically taught in society at least here in the US that the entrepreneur is Bill Gates, Steve Jobs, Michael Dell. Somebody who, Mark Zuckerberg. They left college to go all in on some company that brought them billions of dollars. Sometimes we think of it as like it’s this all or nothing of completely follow my face or became a billionaire. But there’s a huge, huge opportunity in the middle that there’s no guarantees and I think that’s the hard part but by just putting yourself out there you’re going to end up with some result and by not putting yourself out there you end up with no result. [00:31:18] Scott: Yeah and I look at it also as while you’re going through this process one thing will most likely lead you to the next. I know myself personally I can go through every single part of the journey since I was 19 years old up until now 45 and everything happened, I don’t want to say it happened… Because that’s a cliche. Everything happens for a reason. It does but in the same breath it’s like what you do with it is more important and I think then looking back at your journey going ‘oh wow, that happened and that led me to that thing so I learned that skill set and now I’m able to do this.’ I think for you like one major thing that happened to you, and you might not be doing what you’re doing right now if you hadn’t let go. It might not have opened your eyes to say Holy Crap, I guess I’m as secure as I thought I was. I better have like a little back up thing here or I might want to have another revenue stream here, something going on. So something like that might have shook you up and now you’re looking back and going if that might never have happened I most likely wouldn’t be doing what I’m doing today. So I think it’s just depending on how we look at it. I think everyone has certain things… Like you said fear is one of the bigger ones. It’s like well what if I do this thing and it doesn’t work? Then what? Well like you said, you course correct. You figure out why it didn’t work. Then you figure out what you’re going to do next to try to make it work again. That could be pivoting to a whole other market or it could be pivoting to a different platform. Maybe Amazon isn’t your thing. Maybe you’re going to go to a different platform. Maybe you’re going to try eBay. You’re going to be a power seller. Or maybe you’re going to try to start learning building funnels and you’re going to make Facebook ads convert on two or three products. Everything has its opportunity. It’s just a matter of where you’re going to spend your focus to make your situation work. [00:33:22] Scott: Yeah. So let’s wrap up here by you giving me and the listeners really just some advice as far as like again, like right now like you’re at a place where you’re still growing, you’re still growing every day. You’ve got things that you’re putting in place to help you grow but like if someone’s at your situation right now or in your situation where you’re up and running you’re kind of starting, you’re growing, what are your things that you’re focusing on that you would say to someone else that’s kind of where you are too to focus on to kind of keep moving forward. [00:34:03] Kevin: So, I’m looking to push more and more stuff off my plate because I’m starting to see the looking behind me, the growth I’ve had and where the potential for growth is ahead and it’s a different ball game. So right now I am the problem. It’s I now I’m to a point legitimately where a yes to anything is kind of a no to something. And that’s within my business, say if you take the time I have within my business. So I really been working more and more trying to outsource. I’ve hired a couple of part time virtual assistants through FreeUp and I’ve also now decided that I really need to, at this point hire a full time virtual assistant to help me. I can just keep that momentum going and start focusing more on what are those key things to do to move the ball forward. [00:35:04] Scott: Yeah, I think you’re right. A lot of times we have to get out of our way and let things go. I don’t know about you but I like to have my hands on it, I like to know that things are being done and my way is a better way and whether it is or not it’s like one of those things but I’ve also learned when I’m willing to get go a little bit a lot of times we do better. Not because it’s a better job, it’s just because then I can focus on more important things that are going to move the needle in a bigger vision way in a sense. It’s like you shouldn’t be probably packaging your own stuff right not. You should hire someone part time to do that for you because that hour that you’re packaging you could be sourcing a new product or doing your research for a new product. Or putting it on a new platform or whatever. Like all of those things. Side note, how has FreeUp Worked for you so far? I had Nathan on the show. I haven’t personally used them as of yet, I’m thinking about it but we’re about ready but I was just wondering, how has your result been? [00:36:07] Kevin: I’ve used them for a few different projects and for the most part had pretty good results but it’s like any outsourcing company. The more crystal clear you can be about what it is that you need, and I would say as long as they can have some level of basis for what it is the person is doing and how well they would be able to test for that, just in general I’ve had trouble with translation services across the board everywhere I looked. For things like virtual assistant or somebody that can do coding or something like that I’ve had great results. As long as they can validate that person and I’m sure they have great systems. I’m kind of assuming here but I’ve had overall good results. [00:37:05] Scott: Cool. I’ve had others say that they’ve had really good results as well and I know that Nathan talks a lot about they kind of weed out like if there’s any issues like weed that out. They’re always refining so they want to hear if there’s any things. So guys if you’re interested in checking up FreeUp definitely check out theamazingseller.com/freeup and that will direct you over to Nathan’s page I believe. He’s also given a TAS listener’s discount. So check that out. So let’s wrap this up. I know you’re a busy guy, I’m a busy guy getting ready to head out of town again. But I guess if you can give one last piece of advice let’s talk about someone that is just getting started and they’re thinking to themselves I think it just might be too late to the game and I don’t think that it’s possible for someone to go out there and build an ecommerce business in today’s world because it’s just over saturated. What would you tell that person? [00:38:05] Kevin: I would say there’s always going to be some opportunity. And to your point that you said earlier, maybe it’s not Amazon, maybe it’s somewhere else. I would challenge people that Amazon keeps growing. There’s a website called Statastia. Basically I just looked up Amazon sales by quarter and there was this graph and to look at where it is, even the slow seasons in 2017 were way more than like a year for a holiday season. So Amazon continues to grow, ecommerce continues to grow. yesterday or the day before we were driving around and there’s a guy standing at the corner with this ‘Going out of Business’ sign because th Toys R Us is going out of business, as is all Toys R Us. And I was also thinking about the fact that I was going into this restaurant and there was the sign for, here locally it’s called delivery dudes but other places have like Uber Eat and other places where people order food, I think because everyone is so busy and so distracted they want margin back in their life that having to go to a store to buy something or go to a restaurant, even like McDonalds now like you didn’t have to go in the drive through, you just order it on the app and then pull into a spot and they’ll bring it out to you. That’s just the way the market is going. Everyone wants things just kind of given to them so if you can provide that there’s always going to be opportunity and I think ecommerce is giving people that and that’s why people are shifting more and more from brick and mortar stores to people are buying on ecommerce. So is it too late? I honestly don’t think so. I heard this question in 2015 when I was really starting to research, do I want to do a private label brand and I will bet my money if I look back in 2004 when I was buying Nike Forwards there was probably that debate. “Is it too late now?” The dot come had burst so there’s always going to be someone that says too late. [00:40:20] Kevin: And there’s always going to be someone that jumps in and proves that it’s not. So be that person that proves that it’s not too late because I’m going to pretty much guarantee it’s not too late. [00:40:30] Scott: I love it, I love it. All right man, let’s wrap this up together. I don’t normally do this with a guest. I’m going to do it today with you just in case we got a caller technical, it’s not technical in football. What is it? I’m thinking basketball. I’m in the final four here. So it’s just foul, that’s all. So, let’s wrap this up. I want to thank you though once again Kevin. Why don’t you tell everyone real quick though how they can get in touch with you or follow your journey. I know you’ve been documenting it a little bit on YouTube. Go ahead and let them know how they can get in touch with you. [00:41:02] Kevin: Oh great. Yeah. Thanks. If anyone wants to get in touch with me, best way to do it is I’ve got a YouTube channel called Maximizing Ecommerce. If you go to maximizingecommerce.com on the homepage there’s a button you can push that will take you to the YouTube channel. Feel free to leave a comment there. I read all the comments and I try to get back with people there as well. [00:41:27] Scott: That’s awesome man. I appreciate you doing that and again even international talk I think will be definitely talking more on that as well. We’re about ready in the new brand. I’ll be definitely hitting you up on that. All right man, let’s wrap this up. I’m going to go ahead and close this thing down. So guys remember the show notes to this episode can be found at theamazingseller.com/503. Again that’s theamazingseller.com/503. Transcripts, show notes, links all that good stuff can be found there. I’ll also link over to Kevin’s page there. And guys, that’s it. That’s going to wrap it up. As always, remember I’m here for you. I believe in you and I am rooting for you but you have to, you have to… Come on, say it with me, say it loud, say it proud, Kevin is going to say with me on the count of three. [00:42:15] Kevin: Oh, I’m so excited for this. [00:42:17] Scott: One, two, three, “Take action.” Have an awesome amazing day guys and we’ll see you back here on the next episode. 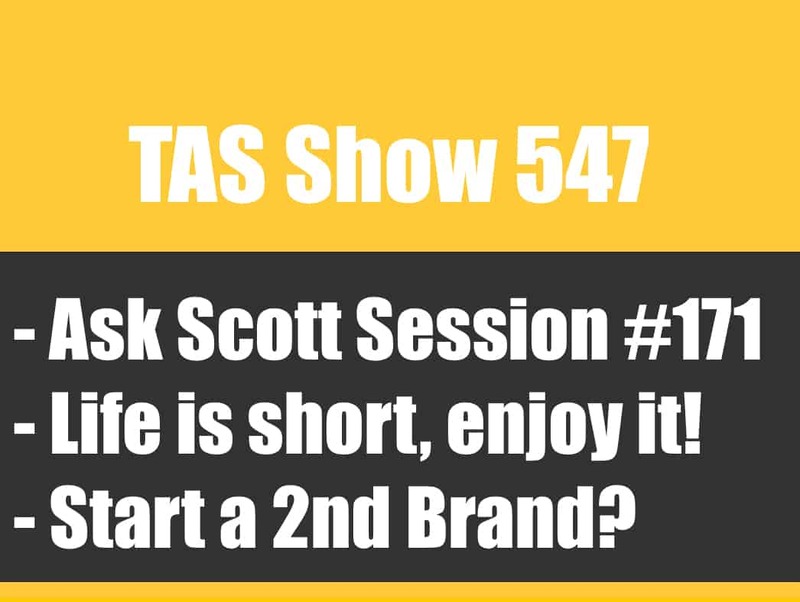 TAS 547: Ask Scott #171 – How To Create a Face to My Brand if It’s Not ME? Hey Scott – I’ve been listening to your older podcasts as a way of learning how to get going, but I listened to this interview and today and have to say, this was awesome and so motivational! Kevin’s view about spending time on developing business and learning versus watching SportsCenter is so spot on! I am so that way, but it’s nice to get an affirmation. Thanks for this.